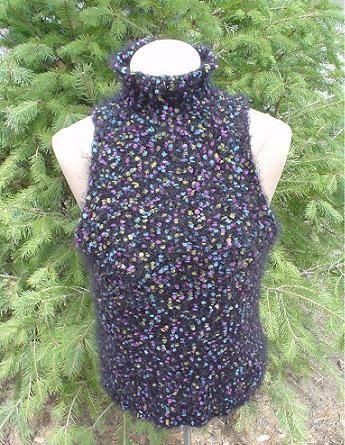 An stretchy, tight fitting tank with pom-pom yarn. Created by the Daily Knitter staff. With circular 29″ knitting needle, cast on 96 (102,114) stitches. Join to work in the round, being careful not to twist stitches. Place marker on needle to indicate beginning of round. Separate 96 (102,114) stitches into two 48 (51,57) stitch sections for the front and back of the tank. Place first 48 (51,57) stitches on stitch holder. Row 3: Bind Off 2 stitches, Knit to the end. Row 4: Bind Off 2 stitches, Purl to the end. Row 5: K1, K2tog, knit until 3 stitches remain on left needle, K2tog, K1. Repeat rows 5 and 6 2 (3,3) times. Continue in St st until piece measures 18 Â½” (19 Â½”, 22″) from the cast on edge. Bind off. Place the 48 (51,57) stitches from the stitch holder on to your needle. Begin working the front of the tank. Continue in St st until piece measures 16″ (17″, 19 Â½”) from the cast on edge. Bind off. Row 2: Bind Off 2 stitches, Knit to the end. Row 4: Bind Off 1 stitch, Knit to the end. Repeat rows 4 and 5 2 (2,3) times. Continue in St st until piece measures the same as the back piece. Bind off. Sew the shoulder seams together. With the circular 16″ knitting needle, pick up 42 (44, 46) stitches around the neck and work K3, P3 around for 2″. Bind off.